If, like me, you have an interest in the Tauchnitz Editions, then a 150 year-old letter addressed to Bernhard Tauchnitz, is an exciting find. If you’re at all interested in English literature, then a letter written and signed by Charles Dickens is something special. 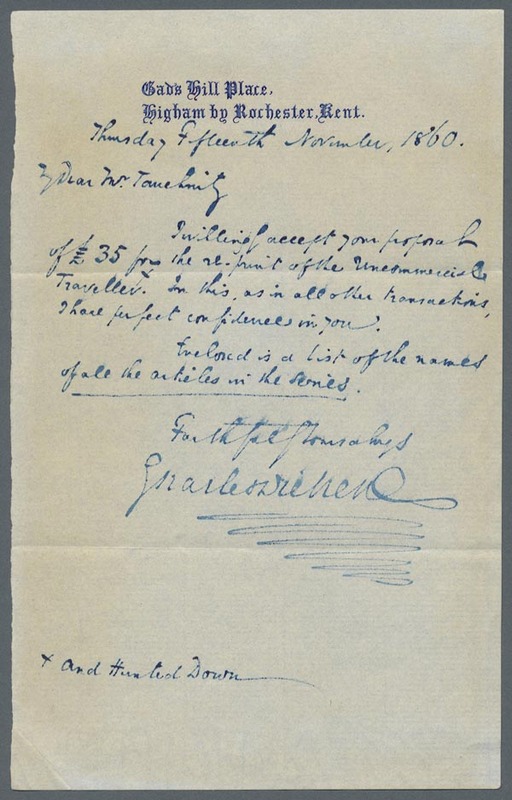 A letter from Dickens to Tauchnitz wins on both counts. This one was written by Dickens in November 1860 accepting an offer of £35 from Tauchnitz for the publication of ‘The uncommercial traveller’ and ‘Hunted Down’. The two works were published together as volume 536 of the Tauchnitz series just a few weeks later, their publication announced on 13 December 1860. 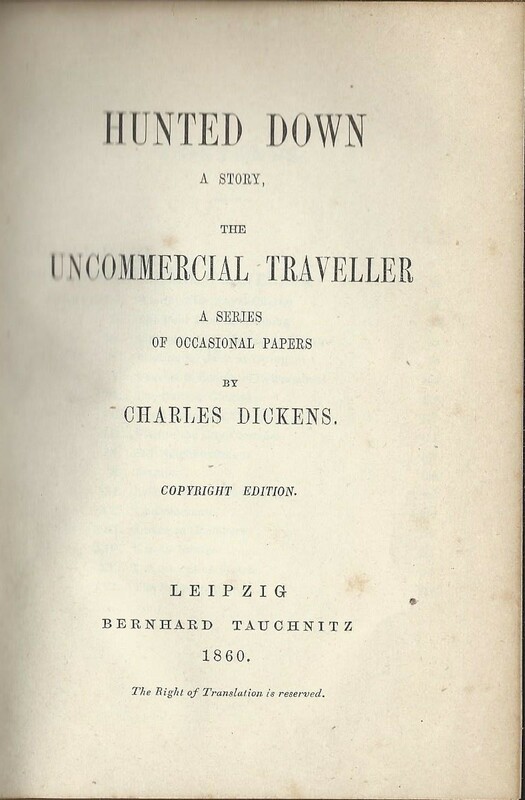 Dickens seems to consider ‘The uncommercial traveller’, a series of sketches from his journal ‘All the Year Round’, as being the main work for which payment is being offered. He adds ‘Hunted Down’ apparently only as an afterthought, at the bottom of the letter, and it accounts for little more than 30 of the near 300 pages in the book. Yet it is this short story that takes pride of place at the front of the book and on the title page. Did Tauchnitz see this as the real prize? The 75th anniversary publication for Tauchnitz in 1912 included a long selection of extracts of letters from famous authors, with a special section for a series of letters from Dickens. It is clear from these that Dickens had absolute faith in the reputation of Tauchnitz for fair dealing. In relation to ‘Dombey and Son’ in 1846 for instance he wrote ‘… I really do not know what it would be fair and reasonable to require from you. But I have every reason to rely upon your honourable intentions; and if you will do me the favour to state your own proposal, I have little doubt that I shall be willing to assent to it …’. In this letter too, he accepts without question the proposal of £35 from Tauchnitz. That may well have been a fair price, but it is worth noting that ‘Hunted Down’ is a story that has drawn attention because of the large amount of money initially paid for it. Dickens was offered £1000 to write it for the ‘New York Ledger’, which published it in three instalments in August and September 1859. He then published it in ‘All the Year Round’ in 1860, and here now he offers it to Tauchnitz as a makeweight in a £35 deal. Its value seems to have fallen from £1000 to just a few pounds in little over 12 months! This particular letter was not quoted in the 1912 publication, but there is an extract from a letter dated just 6 days later, on November 21st 1860. ‘I beg to acknowledge with thanks, the safe receipt of your draft for £ .. Sterling, also, to send you the agreement with my signature and seal attached’. Although the publisher’s discretion means that neither the amount of money nor the name of the work are quoted, it seems fair to assume that Dickens had already received both the contract and the payment of £35. Tauchnitz it seems was a fast worker, and the postal service between Britain and Germany must also have been efficient, possibly even faster than it now is. Clearly Tauchnitz kept files of his correspondence with his authors, and recognised himself that the letters from Dickens were something special. It would be reasonable to assume that they continued to be kept at the Tauchnitz offices and might have been in the premises destroyed by an Allied bombing raid in December 1943. The survival of this letter suggests though that may not have been the case. Perhaps they were kept by representatives of the Tauchnitz family when the business was sold in 1934. This letter turned up last year in an auction in Germany, where it was described as a letter to the German publisher, Tauchnitz, but not identified as being from Dickens. Do other letters still exist out there somewhere? Finally, if that’s not enough, there is another reason to celebrate this find. ‘Hunted Down’ is one of the few stories to be set in the exciting world of life assurance and to have as one of its principal characters, an actuary, the career to which I have devoted most of my working life. Posted on September 17, 2014, in Vintage Paperbacks and tagged Actuary, All the Year Round, authors, Charles Dickens, Hunted Down, Letters, Publishing, Tauchnitz. Bookmark the permalink. 14 Comments.